I am lucky that we have a few Chinese grocers who sell fish. At one I can get a sea bass whole for 3.50 Euro. By whole I mean just that -- guts and scales still in place. But as soon as it's purchased they clean it up ready for cooking. All the benefits of fresh fish with none of the muss! Because as soon as you clean a fish it starts losing flavour. 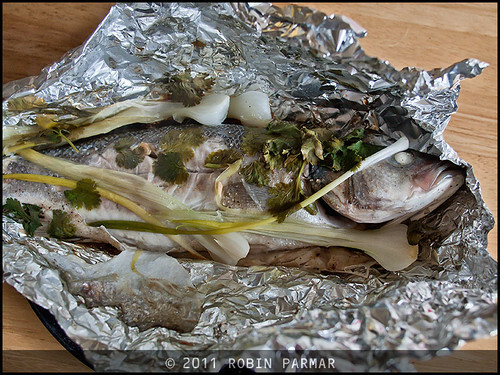 While I'm on the topic, you should never remove the head of a fish before cooking. Leave the entire thing intact. First, it adds to the flavour. And secondly it is considered disrespectful to the animal to do otherwise... at least in Thailand this is the case. In the plank method, favoured on the west coast of North America, you begin by soaking a solid piece of flavoursome wood in water overnight (or at least for a couple of hours). This is so that it won't burn. Place the fish on this slab and put that entire assembly on the BBQ. The aroma of the wood permeates the meat. The third method is suitable for shark, tuna and other very meaty fish -- skewers! As always with shish-kebab, marinating ahead of time makes all the difference; these fish can easily dry out. 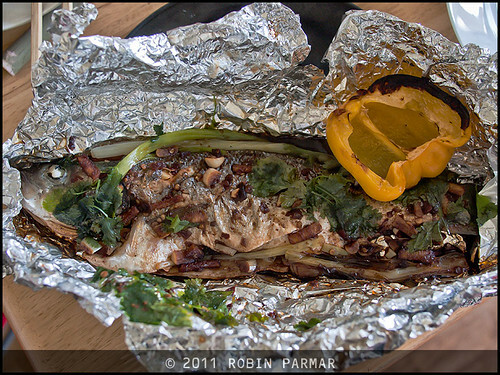 Laying the bass on a piece of tin foil I poured the sauce mixture on top, laying in long thin slices of scallion. Then I finished wrapping it into a pouch. This was placed on a medium-hot BBQ -- because I couldn't get the coals blazing in the on-again off-again rain. When done I served this with plain white rice and some green and yellow peppers I had grilled. Perhaps I should have done some other veggies but instead I cooked a second fish! This one had the same sliced scallion and cilantro, with lemon juice, salt and pepper. With cooking the onions became sweet and accentuated the flavour of the bass itself, but none of the ingredients overwhelmed the delicious fish. This fed only two of us because we were both starving. Yes, we had a fish each! If I was cooking other courses, then half a fish per person might do it. Let me tell you there are few dishes more wonderful! The spicy recipe is lip-smacking good and the other version is a subtle delight.